Halloween Fireworks Dessert Party Tickets at Magic Kingdom on Sale Now! Don’t Make These 8 First-Timer Disney Mistakes! Dine in a castle! The forbidding Beast Castle in Magic Kingdom's New Fantasyland hosts a unique restaurant -- a quick-service spot for Breakfast and Lunch that becomes a table service dining experience for dinner. 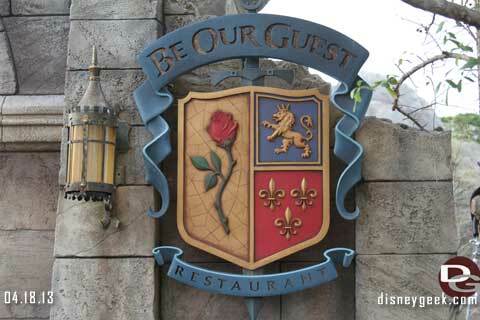 The castle is themed after the Disney animated classic, "Beauty and the Beast," with rooms whose names related directly to the film: The West Wing, The Ballroom and the Rose Gallery. The centerpiece of the Rose Gallery is a large-scale replica of a music box made by Maurice and showing Belle and Beast dancing. The walls are decorated with portraits from the tale and other pieces of art. The Rose Gallery only is open for lunch. The West Wing is Beast's hideaway, dark and foreboding, and the furnishings appear to have been ravaged by Beast's frequent fits of anger. In the Armory Room (a waiting area), there are talking Suits of Armor! There are periodic "thunderstorms" in the West Wing, with lightning flashes and sound effects. When the last petal on an Enchanted Rose placed in the rear of the room drops and the thunderstorm is upon the room, a portrait of Belle's handsome prince changes to an image of Beast.